Organizations like the Latham Foundation have understood the connections that exist among the treatment of animals and the treatment of other humans. This sense of interconnectedness has informed their approach to Humane Education, something they have been advocating since 1918. Humane Education has tended to focus primarily on children, the philosophy being that lessons on kindness and compassion learned as a child would make a lasting impression and, therefore, influence behaviour and attitudes in to adulthood. As Diane L. Beers notes in her book, For the Prevention of Cruelty, “the solution seemed deceptively simple and enticing: teach the children, and the children would rise to heal the world” (87). This is not to say, however, that there have not been Humane Education efforts geared towards adults. One particularly striking example recounted by Beers is that of an American Humane Association-sponsored “evangelical-style educational tour” in the Southern USA in 1919. In the late 19th- and early 20th- centuries there was a push to have Humane Education legislated in classrooms throughout the United States, and it was Angell who led this charge. Thanks to his efforts, in 1886 Humane Education was legislated as part of the curriculum in the State of Massachusetts. Other States followed suit, however, as Unti and DeRosa have noted, this legislation was not enforced with any degree of uniformity. 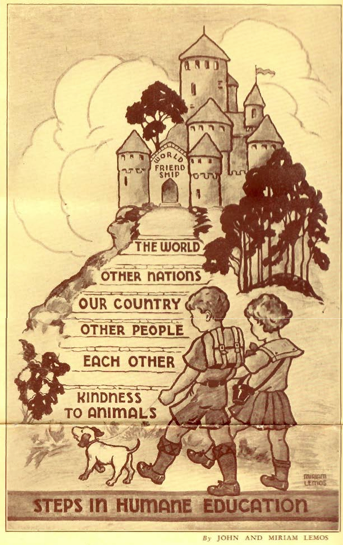 Organizations like the AHES produced copious amounts of material intended to bring Humane Education to children around the world. The annual reports of the AHES detail the activities of their fieldworkers in the United States, Canada, and in many other countries. Bands of Mercy were formed, illustrated lectures were given, and several thousand copies of Our Dumb Animals, the publication of the MSPCA and the AHES, were distributed. Guidebooks for teachers gave suggestions for lesson plans and included material appropriate to all grade levels. I am taken aback and frustrated to find we have covered all this ground before, and have come almost full circle…here I was thinking Humane Ed was only now slowly coming to the fore — but no, it seems it was far more widespread and generally accepted over 100 years ago and all we are doing now is revisiting… sigh.